Fmx – the annual international conference on animation, effects, games and digital media is close! So I am going to be in Stuttgart from Monday 5th to Friday 9th for a couple of interesting and fun days! As I already mentioned a couple of posts before, the music video “Masterplan” was nominated at the ITFS, which is kind of at the same time as fmx. The awards will be given out Tuesday evening – let’s hope we win something! 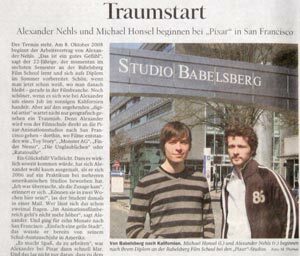 Also I am going to present “Masterplan” and “MTSAT” at fmx for a showcase and introduction of our new university “Babelsberg Film School” (the successor of The German Film School). If you happen to be at fmx too – see you there! Yay, I am a celebrity! To tell the truth, I admit that is a bit of an exaggeration ;) . But nonetheless yesterday I had someone from the “Potsdamer Neueste Nachrichten” (the local newspaper) coming over to my university to have Alexander Nehls and myself interviewed and photographed for an article. The journalist has been tipped off by a friend who knew about our luck with Pixar, so she mainly wanted to know about the Studios, what it feels like to have been accepted and what it is like to work there. Alright, I just migrated completely to WordPress. It’s a really neat publishing platform that gives me the flexibility and ease in adding new content that I always wanted. It was quite a lot of work to create my own theme with CSS and PHP that would match my old design als closely als possible, but it was definitely worth it! My former “News” site is now a proper blog – also with the future at Pixar in mind, because I plan to write about (hopefully) interesting news more often then. Everything should be in place again except for the “Dowload” site which I still have to rework. This is actually almost too good to be true. I got a position as a Technical Director Resident at PIXAR!! After I applied twice for this position (advertised through their online job system) I got an email a couple of weeks ago saying they will setup a phone interview with me! Whew! Of course I was very excited but in the end I think I made a pretty good first impression. And then – finally – the relieving call: I GOT THE POSITION! Well, I can’t emphasize enough how happy I am about this and I can’t wait to start in September after I finished my diploma! 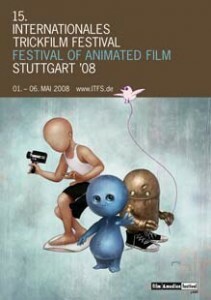 The music video Masterplan (see PROJECTS) was nominated for the International Trickfilm Festival Stuttgart 2008 in the category “Young Animation”! As you might have noticed, the appearance of my website changed slightly. I just wanted to match everything with the design of my demo reel and business card to be consistent. I just applied for the Student Volunteer Program for Siggraph 2008 in Los Angeles! It was such a great experience last year that I definitely don’t want to miss it this year. For my current project I needed a command to evaluate if a given worldspace point is inside a polygonal object. Because I couldn’t find anything like that I wrote the little Maya command plugin “mhIsPointInside that does exacly what I need. What I wanted to do was to be able to create an arbitrarily shaped subvolume from a given 3D fluid container. The MEL-Script “mh_polyToFluidAttr” uses the above command to check if a voxel is inside the poly object to set the attribute for that voxel correctly. This way I could generate an arbitrarily shaped falloff grid. You can download both plugin and script from my DOWNLOAD site. Siggraph really was a blast! I can only recommend participating the Student Volunteer Program if possible. I’ve learned and seen a lot that the “ordinary” Siggraph visitor wouldn’t. And you get in contact with people from the industry – the big companies like Weta Digital, Pixar, Dreamworks, Sony Imageworks, Electronic Arts and more. There are special information sessions for the Student Volunteers, which are quite informal and you can approach them personally. A great chance to drop off some demo reels and CVs! If I can make it next year I will go again! Yay! Only a little over two weeks left until Siggraph! This year I applied for a Student Volunteer Position at Siggraph and got selected! So I am very happy to be able to contribute to that fantastic conference. Next week I will first go to San Francisco to visit a friend and stay a couple of days there. Then I will maybe go to Los Angeles and after that to San Diego on 02. August to be able to start my shifts for the conference on the 3rd. All works shown on this site are property of Michael Honsel unless otherwise stated.